A few years back 80 series suspension was fairly easy to figure out & purchase since there was only a few of options to chose from. Recently there has been a few suppliers stepping up to play in the USA 80 series market offering more options. Now with a plethora of options, it has become confusing to figure out. I compiled a bunch of specs on suspension components that I have researched & I wanted to get it all in one place for reference. Enjoy. Links that I have resourced specs & info from. OME shock length just doesn't make sense! Going from OME 50mm to Dobinson 3" Tapered Coils: What All Is Needed? Start at page 145 for 80 series coils. Terms for different type of coils. This will help with the mm dimensions. These spec are all approx., reason is most people "speak or write in general." If you like you ride & handling of the stock coils but want to use a longer shock like the L shock then one can just add a 30mm coil spacer on top of the stock coil to get enough free height to prevent the coils dropping out at full extension of the longer L shock of 26.5"
AS basic as I can tell you is the L shock was made for an 850J coil which the free height = 20.27"/20.67" The shortest OEM coil stands at 18.5" then add the spacer 30mm/ 1.18=19.68". I ran a 850 equivalent free height coils of 19.48" with the L sock without any issues of coils falling out, so it is safe to say as long as your free height is at least 19.5" you can run a shock the extends to 26.5" like the OME L shock without coil falling out. Does this make since? If you add a 30mm coil spacer to stock coils one can run the longer OME L shocks. The OME L shock suits the 850J coil which is 20.27"/20.67" in free height. If any other coil with same free height or taller can run a OME L shock which extends out to 26.5" measured at the collars. So, if you add a 30mm to a stock coil of 19" then it comes out to 20.18"
Even the shortest replacement coil (48131-6A570) at 18.5" will work. 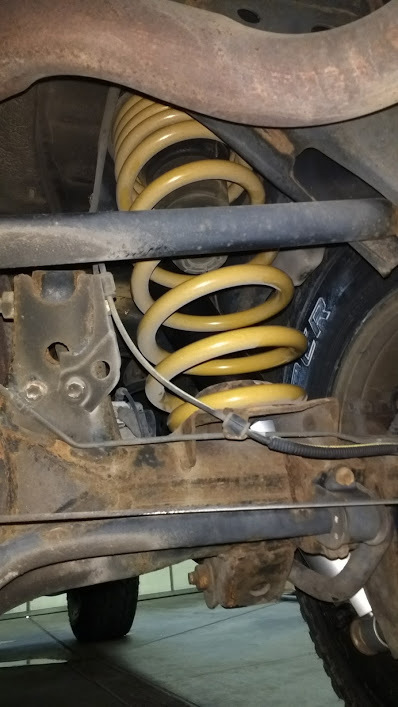 I have ran 850 coils with L shocks no problems... they are 19.49"/19.88"
What is my lift height? Both of my measurements of the "L" shocks is a little different at 15.25"/26.5"
The hybrid or level combinations are as follows for lightly loaded rigs. One can use the longer L shocks (60070L/60071L) to keep coils captive. Below are some pics & links to support my theory of level stance. 850J front, 863 rear, 37s? OME 866 on a 80 series? Old Man Emu dual rate coils are the 861, 862 & 866 see charts above. Dist through Apex Overland , Land Cruiser Heaven & Dobinson USA & more. Dobinson carries several types of coils Linear, Flexi and Tapered in many lift heights. Going from OME 50mm to Dobinson 3.5" Tapered Coils: What All Is Needed? GS59-684 needs about 1.5” bump stop spacing with a minimum coil length of 570mm/22.44"
The 4" lift Dobinson yellows are a bit longer than a OME real L shock. 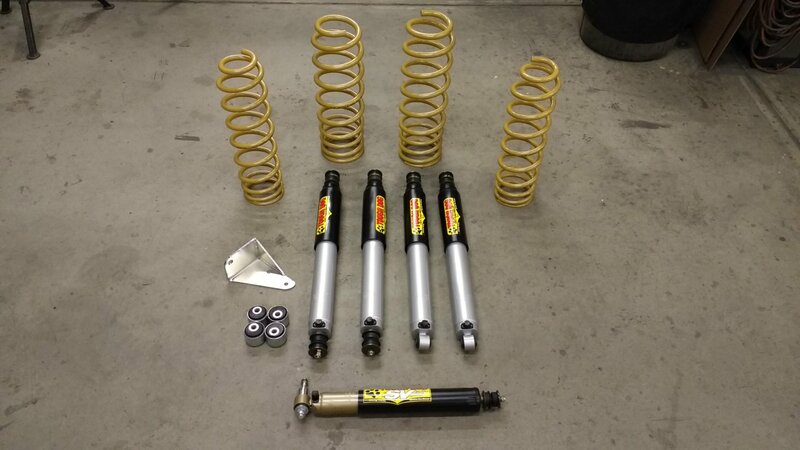 I have been told the Dobinson yellow shocks are softer on compression & slower on rebound compared to the OME L shocks. Below is a set of 3.5" Tapered fronts. It’s like adding teenage girl nail polish to toxic sea foam. Second, the free height of the 4” Flexi rear coils is almost 23” - that spec was missing in the original post. Having seen the rears in person now I have also ordered the fronts. Dobinson’s front 4” Flexi installed. This coil is shorter than the rear, about 22.5” free height. Way more coil than the front can use in any case - I dropped the whole front end on both sides to the stretch point of the brake line, leveraged out the old coil with a 4’ bar and kick method, and then used compressors again for the Flexi. As compared to the FOR Gen II it replaces. I’ve picked up about an inch of lift at all four corners. I’m right about 25.5 hub to fender (no flares), wrapped around the tire. I’ll measure more carefully tomorrow in the daylight. Ride quality for my relatively light rig with the Fox 2.0 remote reservoir shocks is outstanding. The front feels pretty much the same outside of what I think was some coil damage from my accident - the front driver’s got torqued pretty good with frame bend and a bent radius arm and it had lost about a half inch of height. It’s the rear that feels like it has more control - there is a lot of extra coil and it feels extremely well dialed. This seems a shift in rear coil design philosophy, more than just “longer shock”. Definitely a clean 4-4.5” lift and seems very well thought out and executed. My 37’s are going to look a little bit small now. The coil color, OTOH, is perfect. C59-169 - Standard height, heavy load with 300LB load (rear bumper, etc) - linear rate. Trail Tailor carries two brands of suspension lifts from stock height to 6"
ALL fronts are a Heavy Flex for use with bumper, winch and add second battery. Stock height coils are NLA, The 25mm is a more common item I usually stock. Obligatory coil comparison. OME 863J and Tourflex 3". 41mm foam cell shocks are made by either Gabriel or Tenneco (Monroe) in the US or Mexico. Then sent to AUS for QA/QC, batch testing and final assembly/packaging. Mine have Gabriel on the bushing. OME L front shocks are a bit longer than the 41mm Tough Dog. And, the springs side by side. Tourflex 3" vs. OME 850J. Very pleased with @reevesci 's excellent service, great communication, and quality product. Look forward to my next purchase from him, the redneck skid plate. 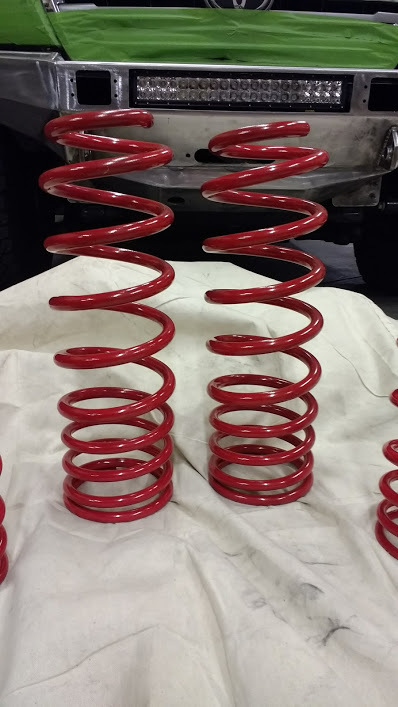 80 series Slinky/ICON Long travel suspension officially coming to the U.S.A. Above is the 7498 Int fronts & below are the Int. 7501 & HD 7511. Slinky rear bump stop is 30mm taller than stock. (this would equal a 30mm bump stop extension). rim to fender is 800-825mm, and because the last 2 5/8 thick coils are completely dead, it allows us to trim heights to suit by removing a coil if we need to. We also have a 290 lb front for fully loaded diesels. This is a linear coil for the 670mm shock length, but not Slinkies. Its an 810 - 820mm rim to fender height. Our AC7501 rears are 270lb intermediate, 810-830mm rim to fender and AC7511 320 lb HD 810-830mm rim to fender. 330 lb longer lineear coil 30mm higher AC7511E extra HD 830-850mm rim to fender. 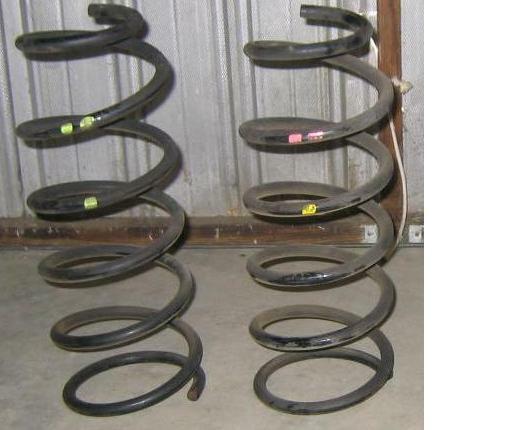 We also have a 495 lb rear coil for big heavy extended chassis tourers 830-860mm rim to fender. All our slinky coils are 160 lb on the tapered wire section. We normally try and work to a 30mm [1 1/4"] rake when vehicle accessory fitted but unloaded as we see it to install. Our intermediate coils drop aprox 12mm [1/2"] per 100kg of load. Our HD drop aprox 8mm per 100 kg of load. How we measure those, rim to fender, for 80 we talk 16" rim, and add 12mm for 17s, 24mm for 18s, etc. This makes it easier with deep dish wheels, than centre of hub, and removes tyre pressure variants. 53005 front is 190/300 ~ 21.5"
53006 rear is 220/280 ~ 20"
Rear coil rate changes between 12.5" & 13.5"
Front 56509 15.35" - 26.17"
Rear 56510 15.6" - 25.67"
Front 57801P 15.35" - 26.68"
Rear 57802P 15.97" to 26.30"
Front 57803 15.95" - 27.88"
Rear 57804 16.97" to 28.3"
Notice these coils do not touch each other. 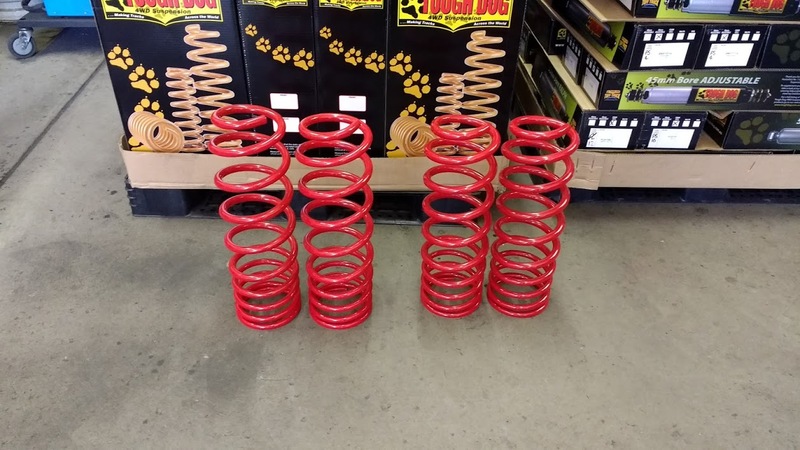 They are a taller coil with more winds vs. OME medium/heavy which likely means a more supple ride and lower spring rate. Very good on an unladen 80. After a lot of reading I have found that most people who have stock to light rigs really love the suspension it's really great but once you start putting heavy thing's in your rig like armor and bumpers and drawers and stuff these rear coils just can't handle the weight. @Shoredreamer had this set up till his 80 got fat. 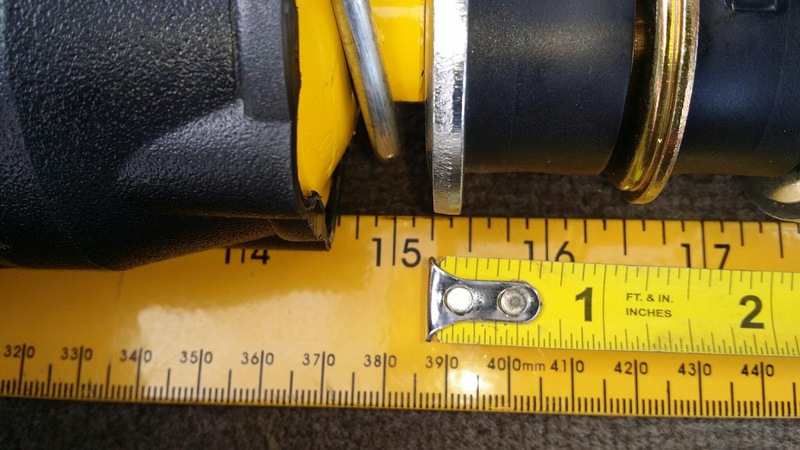 @Heckraiser posted this about his 2" TJM 50mm lift. @Hitit66 here on mud sells nice aluminum ones along with sway bar extension blocks. Shock manufacturers give specs without bushings & collars like pic above. 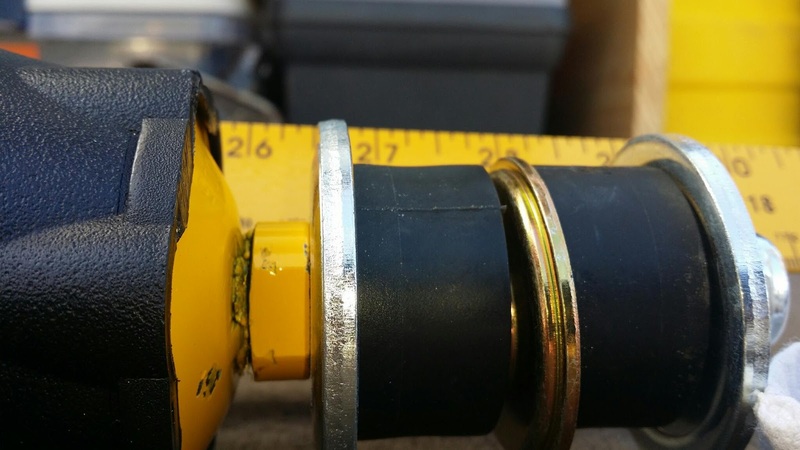 You must add the height of the bushings & collars to get accurate mounting measurements. 1 bushing & 1 collar = approx. 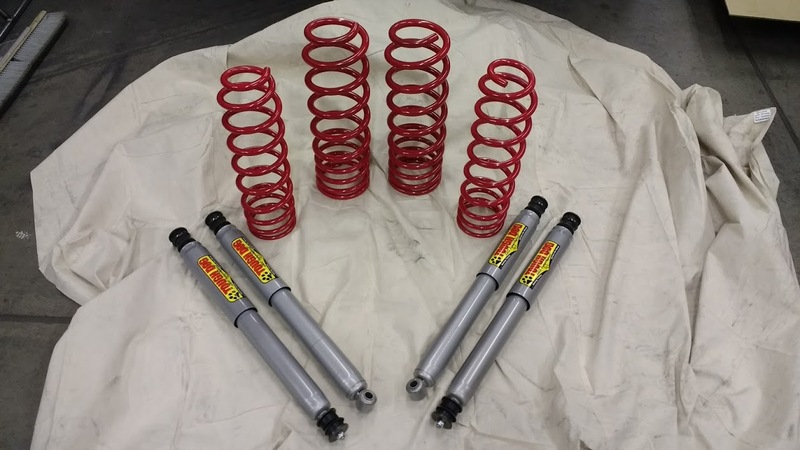 1"
My compressed measurements for the shocks without coils sitting on OEM bumps measured from mount to mount (metal to metal) front is 18.5" & mount to eye bolt for rear is 16.5"
Both of my compressed measurements of the OME "L" shocks are 15.25"
Bilstein 24-014786 rear 594/365 mm 23.38"/14.37"
Bilstein 24-014779 front 591/380 mm 23.27"/14.96"
Some use a U bracket on this shock below for loner ext. Won’t have my kings 2.5 3-4 inch lift shocks till next month but I finally was able to get some specs. They are NOT yet making 2.0 shocks for the 80 because the 80s are so heavy they don’t think 2.0 shocks will be sufficient at least not to their standard. All kings current make are 2.5 with remote and the 2 models are with or with out compression adjust, I think the one with compression have additional feature of internal 1 inch bottom out bump assist. Both version have flutter valves to creat 2 zones/stages of damping. I didn’t find out about the bump assist or I would of coughed up the extra money for the adjustable version, maybe during my first rebuild. They are custom shock place so they can be order however valving you want and as many extra features as you want. The King’s current 80 specific 2.5 shocks valving profile is developed on @jtwopark 's 80, they had it for 2 months. So they definitely spent a lot of time refining valving for a heavy fully armored 80. They do have soft, medium and hard valving however to suit your needs, or just go full custom. Good work Nugget! Might be cool to upload an image of individual rigs outfitted with each suspension setup so others can determine stance when considering options. This would've saved me a TON of research a few years back! Good job. Some great info in here. I sent you some other info to add if interested. There’s a lot of decent springs out there (depending on setup) and it is unfortunate that not all supppliers provide rate information to the consumer. Bravo, this is good internetting. This. Thread. Is. Awesome. Thanks @GW Nugget! How you pried spring rates out of each company, I may never know. Can we sticky this and keep it up to date? Great job compiling the info!